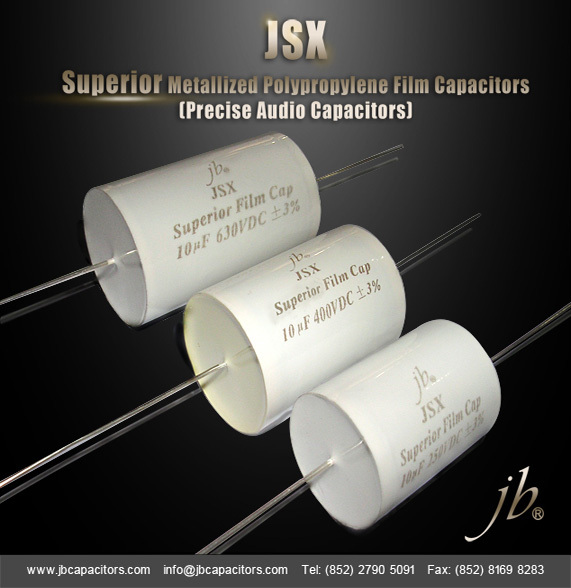 In the search of a affordable audio capacitors for decoupling purpose, I have got the JFX and JSX series from jb Capacitors. Now I will explain how they are compared with a a few others of similar size range. To have similar requirements I have a relay switch board next to my pre-amp direct out from DAC. 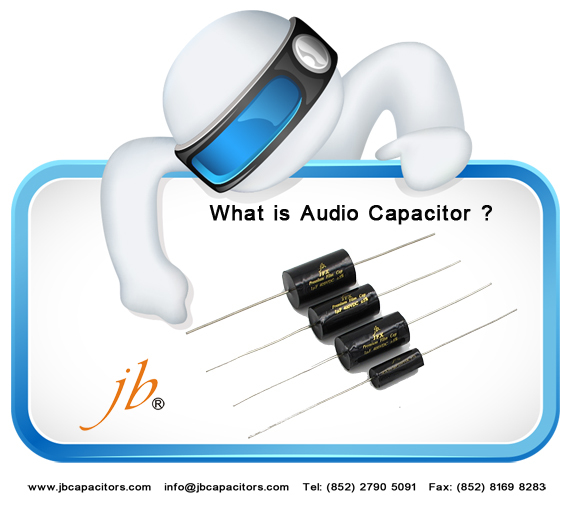 All DC coupled and no other capacitors in this way. 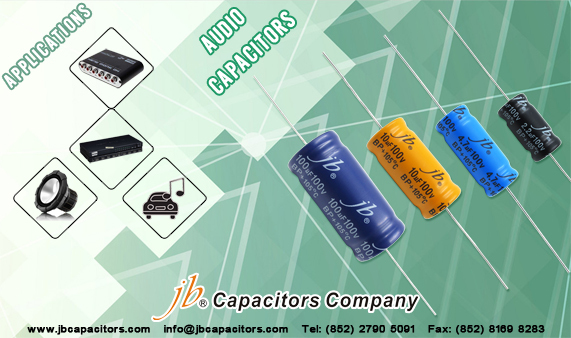 DAC output impedance is 47Ohm, Pre-amp impedance is 470kOhm. These are very common values and should be give a good start point for comparisons. I can switch direct from capacitor to capacitor and DC coupled. Mesurements are all very good. most below my measuring equipment. The tolerances where all below the printed 5%(JFX) and 3%（JSX）. I have measured 1.36% and 0.99%. The dielectric dissipation factor has been tan:<0.001 at 1kHz. JFX: Detailed, gives a realistic soundstage and stress free listening. very natural and a good tonal balance. My favourite for acoustic instruments and voices. Clear with more midrange. Makes sound a bit hard and grained. Detailed and holographic presentation, seems to be a bit louder, but tonal balance is not perfect. After longer listening I feel like disrupted soundstage. Musical and warm, but less detailed. Overall both types are very high quality and for sure a good choice for a competitive price. 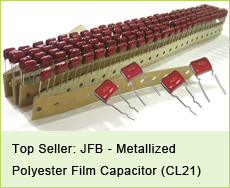 jb Capacitors has surprised me with excellent capacitors. They are not expensive, small sized and good sounding. 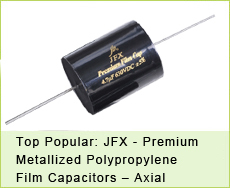 They beat most of even more expensive capacitors. Well done! 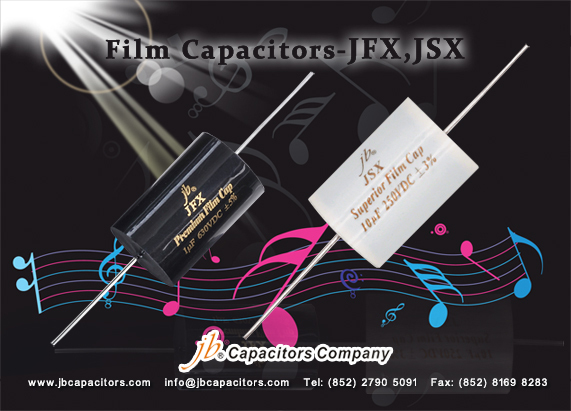 Does your market has demand for low DF values audio capacitors, that is to say the superior audio capacitors, which is a higher level of our present JFX. We call it as JSX, we sell JSX a lot in our domestic market and enjoy extraordinary feedback. We're planning to promote JSX to oversea market too. Please send us your RFQ if you are interested in pursuit higher quality products. Limited samples are on hand now. First come, first served. We are looking forward to cooperate with you. We are happy to introduce our company best product to you. Very Low Dissipation Factor . 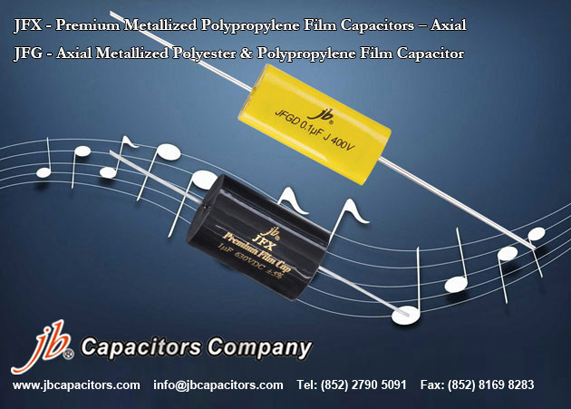 The best choice for your audio sounding applications. 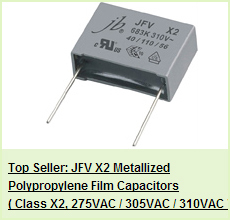 JFG series Cross guide: Acrotronics(Kemet): MKT A50, MKP A70, KP A72, Vishay: MKT1813, MKP1839, MKP1845; Epcos: B32231~32232, B32669 etc..
JFX series is high end audio capacitors, excellent replacements of Mundor, Jantzen Audio, Auricap, Solen, etc..
Germany Fair Bulletin: jb capacitors company would like to invite you to visit our Booth No. B6.536/3 for 2014 Electronica in Munich, Germany, Date on Nov. 11th ~14th, 2014.